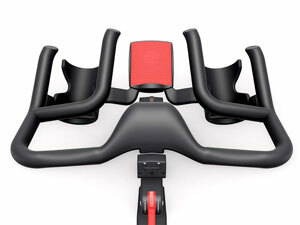 The IC4 indoor cycling bike, also referred to as Life Fitness “Tomahawk”, is one of the models released by Life Fitness in 2016. It’s still available to this day and remains one of the best exercise bikes in this price range. It’s a light-commercial grade trainer designed for spin workouts. It’s basically a lighter version of the Life Fitness GX and also does not include a fitness meter. However, it also costs approx. $500 than the GX model. 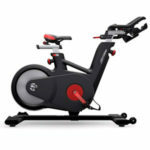 As we’ve mentioned above, the Life Fitness IC4 indoor cycling trainer is designed to support any spin workout. It features a very sturdy construction with a frame made of durable steel tubing, with the exception of the seat and handlebar posts which are made of high-grade aluminum. All the steel parts in its construction are coated with a corrosion-resistant and abrasion-resistant paint finish. Most of the core frame of the unit features solid ABS covers which prevent sweat to reach the paint finish. Also, these covers give the bike a very professional aspect which can be quite a motivation factor. The bike features a V-frame design which offers two main advantages. One, the bike has a low center of gravity which considerably improves its stability. And two, when the seat post and handlebar post are extended, the distance between the saddle and the handlebar also increases, which leads to a better accommodation for a taller user. The bike’s stability is enhanced by its overall weight. With the frame fully set up, this Life Fitness exercise bike weighs approx. 110 lbs (50 kg), which is more than twice the weight of the average mountain bike. Plus, both its base bars are equipped with adjustable levelers which have large rubber pads. Therefore, you can perfectly level the unit on any type of floor, and the usage of a rubberized mat is not necessary, because the units “feet” provide an excellent grip on the floor, also protecting it from damage. Despite its weight, this indoor cycle is not too difficult to move especially one it was fully assembled. Its front base features large silicone wheels which facilitate its relocation. 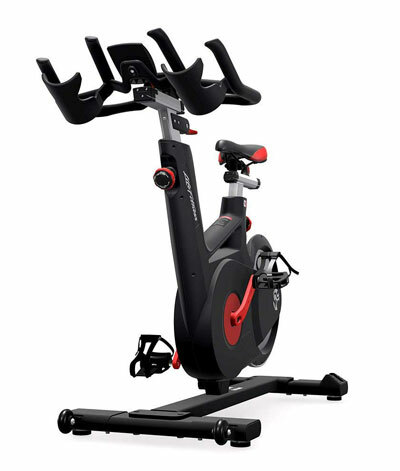 Due to the rear drive frame design, the Life Fitness IC4 is slightly larger than other spin bikes. It measures 52″ (132 cm) in length, and approx. 21″ (52 cm) in width. On top of that, it is recommended to leave at least two feet of clearance on the sides and at the rear, and at least one foot of clearance at the front, for safe operation. In terms of accessories, there are two that can be mentioned here. One is the dual bottle holder which is incorporated into the handlebar. The two bottle slots are large enough to accommodate any type of hydration bottle. The other is the phone holder which is placed between the two bottle holders. It features plush pad to provide a better stability for your phone. The whole bottle holder/phone holder assembly is made of a thick sheet of ABS material. This indoor cycling bike does not include an exercise meter. 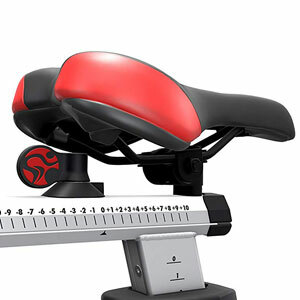 The Life Fitness IC4 is equipped with a comfort spin saddle almost identical to the one on the BodyCraft SPT-Mag bike. It integrates a thick layer of padding especially in its rear section and has a center cutout to improve breathability. Its surface is made of a durable, sweatproof vinyl material. Also, its attachment system to the slider is standard, which means that compatible options are widely available, in case you will ever need to replace it. The seat offers 4-way adjustability (up, down, forward, backward). Its upright post offers 23 adjustment positions, with approx. 1″ (2.5 cm) in-between. Its horizontal slider has 20 mode front-to-back adjustment positions with approx. 1/2″ (1 cm) in between. On top of that, due to the V-frame design, the distance between the handlebars and the seat increases as well when you extend them. Therefore, the bike can accommodate with no problem users between 5’0″ and 6’7″ (153 – 201 cm), allowing a complete range of motion. Just as the seat, the handlebar assembly offers 4-way adjustability (up, down, forward, backward). Its upright post offers 15 adjustment positions (1″ in-between), while its horizontal slider offers 10 front-to-back positions (1/2″ in-between). It features a multi-grip design with integrated aero bars. It’s completely rubberized in order to provide a secure and comfortable grip. One important feature that needs to be mentioned here, regards the horizontal adjustment system of the seat and handlebars. Both sliders have levers (not knobs) which can easily be unlocked when turned sideways. Therefore, you can easily unlock and re-lock the saddle or the handlebar assembly in order to adjust them forwards or backwards even if you are already on the bike. Not many bikes offer this feature and require you to pause your workout and dismount to make the correct adjustments. 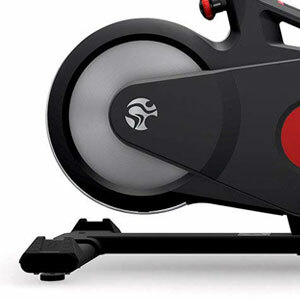 The Life Fitness IC4 indoor cycling bike is equipped with a manual magnetic resistance system. This means you don’t have to connect it to a power source in order to benefit from resistance adjustments. Its resistance system consists of a magnetic brake placed at the covered section of the flywheel. This brake is attached to the tension lever placed on the handlebar post. By pressing this tension lever down, the magnetic brake covers a larger portion of the flywheel which results in a higher pedaling difficulty. Conversely, if you lift the lever up, the magnetic brake moves away from the flywheel, leading to less resistance. The resistance settings of the bike aren’t numbered, but the tension lever does have markings on it which delimit each difficulty level. There are more than 30 markings on the lever, and of course, more than 30 distinct resistance settings. Thus, the bike provides an exceptional micro-adjustability when it comes to pedal tension. 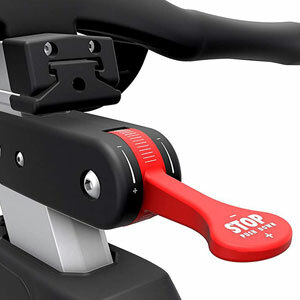 The tension lever also functions as an emergency brake. You can press it all the way down in order to stop the flywheel from spinning. This may actually be required in certain cases because the pedals continue to spin for as long as the flywheel is spinning. This Life Fitness exercise bike is equipped with a balanced flywheel. Its exact weight is not specified, but considering its diameter, its weight should be between 35 lbs and 45 lbs (15.5 – 20.5 kg). Its weight shouldn’t matter that much, though, because the bike’s resistance system uses a magnetic brake, not a friction brake. Therefore, the resistance remains constant throughout a full rotation. More importantly, it rotates at 10:1 of your pedal stroke which results in an excellent inertia, perfect for spinning workouts. Needless to say, the flywheel is bi-directional. It offers the possibility of pedaling in reverse. This way, you can diversify your workouts. However, it’s important to always use the emergency brake when you switch from front pedaling to backpedaling and vice versa, to prevent any injuries. 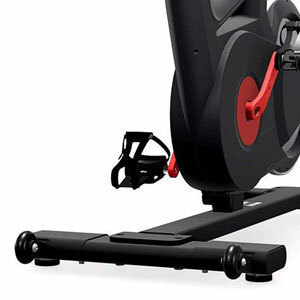 Like most other exercise bikes with a magnetic resistance system, the Life Fitness IC4 features a belt drivetrain. It uses a durable poly-v belt which delivers a very smooth and quiet pedaling motion. It also does not need any maintenance. On the contrary, it’s recommended to keep away any lubricants from it, to prevent it from slipping. The bike is equipped with a heavy-duty crankset, featuring steel crank arms and metallic alloy pedals. This being said, it can withstand any spin workout including standing up on the pedals, even if the user is close to the maximum weight capacity (330 lbs). The pedals are dual-sided; they have toe cages on one side, and SPD clips for spin shoes on the other. They also have standard threads (9/16), so compatible replacements for them are widely available. Last but not least, the Life Fitness IC4 features a narrow Q-Factor (spacing between the pedals) of 155 mm. Therefore, your feet are placed on the pedals in a natural position, so the pedaling motion does not generate any extra lateral stress on the knees and ankles. The core frame of the bike, with its drive and resistance elements, comes already assembled. You only need to attach the two base stabilizers, the seat, the handlebars, and the pedals. This shouldn’t take more than 20-30 minutes. The manual provides clear assembly instructions. However, the box does not include the required tools for the assembly; you will need a set of Allen wrenches and an adjustable wrench. This exercise bike requires very little maintenance. It is recommended to keep the frame clean. The seat and handlebar sliders and posts may require a bit of lubrication for a smooth usage. Other than this, a periodic check for loose bolts and parts is a good idea. Tools for assembly are not included. The Life Fitness IC4 is a light-commercial indoor cycling bike featuring a magnetic resistance system, a heavy flywheel for high inertia, and a durable crank with dual-sided pedals. It features a V-frame design offering superior micro-adjustability, and a weight capacity of 330 lbs. It’s definitely a solid bike which can support any spin workout. It’s perfect for high-intensity cardio training, interval training, strength and stamina development, and weight loss. It’s not exactly an affordable exercise bike, but nonetheless, it offers an outstanding quality for the price.